Recently a online-discussion came up as to how to identify your direct ancestors when building a family-tree at ancestry.com. I can understand the discussion. Looking at a family tree on Ancestry, especially a descendant chart, can be confusing, even if it is your own. Along with the usual selection of ideas (writing their names in CAPITALS, adding an asterisk after their first name etc.) one person kindly added a couple of simple images they had created (see below). The idea is that you add these as profile pictures to your direct ancestors. Personally, what I do is slightly different. To me it’s important, especially when I’m working on my wife’s German family tree, to understand the location that each ancestor came from. Most people’s ancestors came in clumps from specific regions, or even specific villages. My wife has ancestors coming for as far west as the Dutch border and as far east as Silesia. As a dumb Brit I find it hard to immediately recognise their ancestral villages by name. What I’ve ended up doing is using the town/village Coat of Arms, as a profile picture, to mark all of my wife’s direct ancestral line. 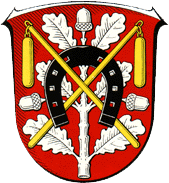 This works particularly well for Germany where pretty-much every village has it’s own “Ortswappen” (coat-of-arms). This way I have a visual clue to both the ancestral lines and the individual’s birth location. 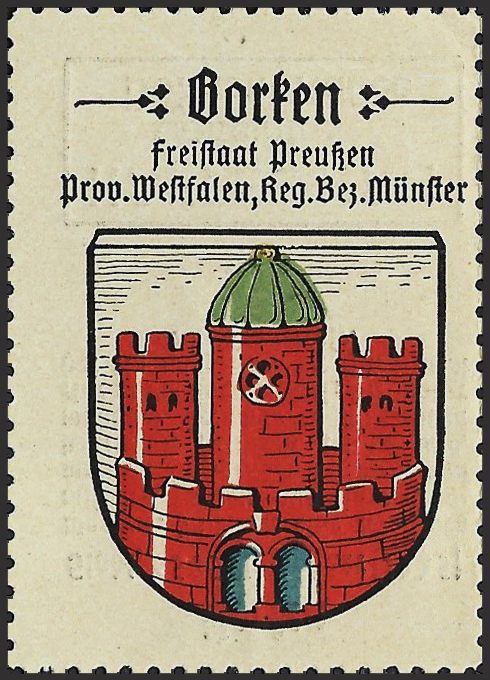 Being an ex-stamp-collector I’m naturally drawn to stamps that carry the German towns’ Coat-of-Arms. 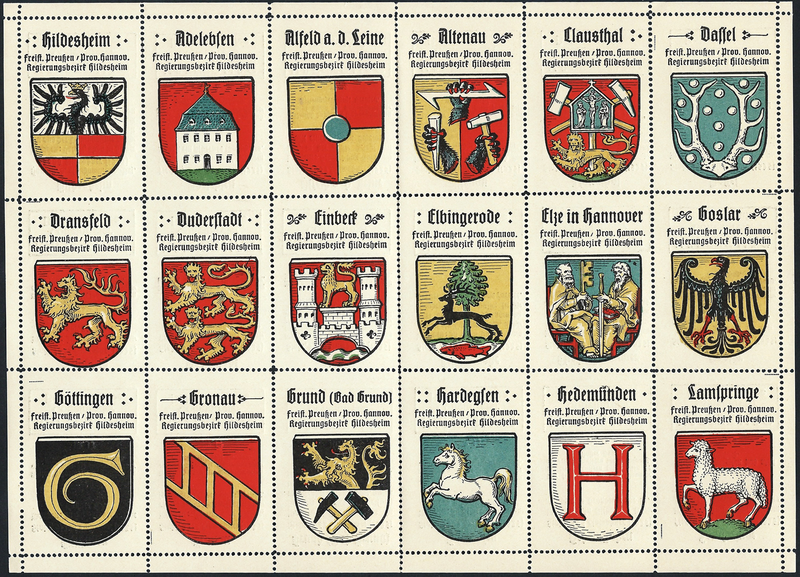 As luck would have it the caffeine-free coffee-company Kaffee Hag produced a number of sets of promotional stamp-albums way back in the 1920’s that depict over 700 different coat-of-arms from towns all over Germany. There are also sets of international albums that cover most of continental Europe and the British Isles. As far as I can see the are no copyright issues on such items. You can find images of the stamps here, or, like myself, you can pick up either full sheets, or individual stamps on ebay in Germany. As an alternative you can always grab the “Ortswappen” from the appropriate page on Wikipedia. These are typically available under the Creative Commons CC0 1.0 license, which makes the image in the public domain. 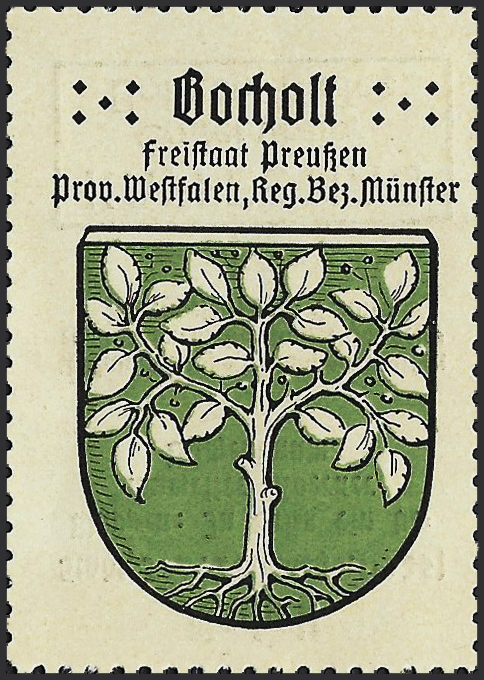 As an example, the Ortwappen for my local community, Mörfelden-Walldorf is available under this license. 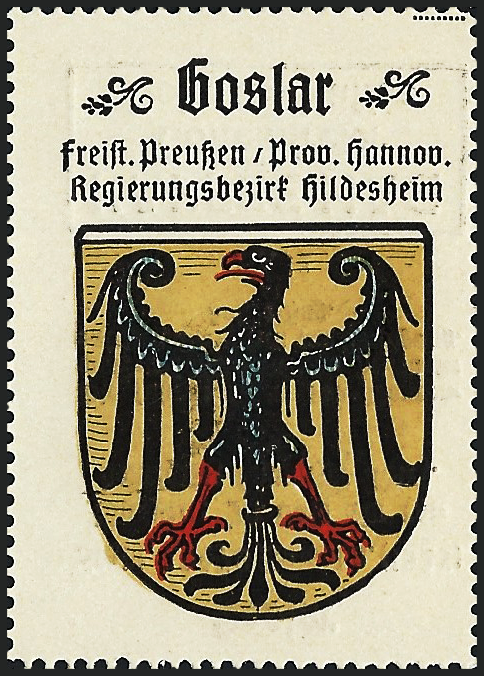 As a bonus I find it useful to use these Coat-of-Arms to identify places in what was Silesia. Following the Second World War some of the places where my wife’s ancestors were born (e.g. Breslau) have become part of Poland. As a result both Ancestry and Family Tree Maker expect the current Polish town names, rather than the old German names that match the family records. One downside of this approach is that these images appear as “Photo hints” for other Ancestry users. Naturally it may irritate a few folks. On the other hand I have seem some people use the images in their family tree. I guess it’s swings and roundabouts ! Normally when I write something here it’s because I think I have something useful to say. This time I want to write about how I record my DNA matches in Excel. I’ll be honest, I’m sure I’m not the first person to do this, and I’m not suggesting that this is the best method, but it does help. It’s cross-platform i.e. it keeps all your matches from Ancestry, 23andMe, MyHeritage etc. in one place. DNA matches sometimes disappear from your online lists. The matching algorithm used by the DNA testing companies do change, but more commonly matches choose to remove/hide their information. Recording matches can show you patterns of inheritance that you might not otherwise spot. 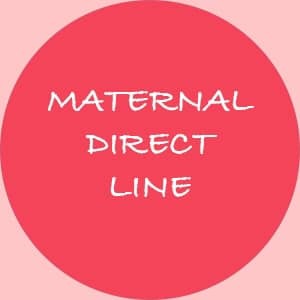 As an example I can see that someone that shares my mitochondrial DNA as both she and I are on the same direct maternal line. There are plenty of examples online where yDNA or mitochondrial DNA has helped prove a theory, probably non more-so than the identification of Richard III of England from his mitochondrial DNA. You can get statistics from this data. I love statistics, more of this later. You don’t keep going back to the same DNA matches, only to realise you’ve already done the research. I should mention that this article focuses on working with results from ancestry.com. This is because it is the main source of cousin-matching information. Roughly 85% of my cousin-matches come from ancestry.com (the joy of statistics). One of the key new features of the 2019 update to the Ancestry group of websites is the Common Ancestor feature. This is a little different, both in content and display, from Ancestry’s previous Shared Ancestor Hints feature. Common Ancestors does not rely on you both having a, ahem, common ancestor in both your trees. Instead it does what many genealogists already do and build a link between the two trees using both your trees and other people’s trees. This will typically mean you have more Common Ancestors than Shared Ancestor Hints. In my case I have 25 Shared Ancestor Hints but 51 Common Ancestor hints. I’m guessing that the algorithm Ancestry is using is actually quite computationally heavy. This would mean that building and refreshing this list takes time. This would fit in with the fact that yesterday I only had 40 Common Ancestors. It’s probably now time to cover how the Common Ancestor feature works. Yesterday (15th Feb.) I received an update to how my DNA results were displayed. Somehow, I’ve been on of the lucky testers who get some of the Beta features before they are made available system-wide. Last year it was an update on ethnicity estimates and now I have new layouts and new options to manage my DNA matches. I thought it might be worth reviewing those features. On the 3rd of February, following concerns about how FamilyTreeDNA changed their Terms of Service, they reverted their Terms of Service “to our May 2018 version“. In addition they announced a plan to “create a panel of citizen genealogist advisors who will work with us as we focus on how to make your FamilyTreeDNA experience the best one available“. This move has been justified by FamilyTreeDNA President and Founder, Bennett Greenspan, as “crowd-source the catching of criminals” (see this video). This idea was re-iterated in a letter FamilyTreeDNA sent to their customers which stated that this was “an opportunity for honest, law-abiding citizens to help catch bad guys“. Personally, I find this a disappointing move by FamilyTreeDNA. They are, after all, an early pioneer in the field of genetic genealogy and are one of the main reasons this technology exists today. Reaction within the genetic genealogy community has, predictably fallen into for and against camps. I have long been concerned about the potential conflicts genetic genealogy brings to our privacy, but I think it’s worth covering five reasons why I think it is dangerous to mix genetic genealogy and law-enforcement issues. Reporting of the issues at FamilyTreeDNA has already spread beyond the genealogy community into both tech websites such as nakedsecurity and theregister as well as mainstream news organisations such the UK’s Independent newspaper and the New York Times. As this information becomes available to the public it’s going to make people more reluctant to try a DNA test. The fine differences between identifying serious criminals via long-range familial searching and the more direct idea that police will “have your DNA on file” will be lost to many. In addition those “Cousin, would you mind doing a DNA test for my research” conversations that genealogists like to have are now going to be much more difficult. This is going to significantly impact genetic genealogy within those communities that have strained relationships with law-enforcement agencies. These communities are often already under-represented in DNA databases as well as being over-targetted by law-enforcement agencies. This is also an international issue. whilst many people will have confidence in the transparency and rule of law in their own country the same may not be true for relatives in other countries. Most North American genetic genealogists will have ancestors that came from other countries. Relatives in those countries may both have information on shared ancestors and a less-open and fair legal system. The concept of police use of DNA databases for familial matching is not going to help connect new-world researchers with their relatives in such countries. There is an old adage that “One man’s terrorist is another Man’s Freedom Fighter”. Last October I attended the genealogy show “Back to Our Past” in Ireland. Among the presentations was one presenting the results of an informal survey of genealogists. This asked a number of questions within the genealogy community regarding the use of their DNA by law-enforcement agencies. These questions were being asked as a follow-up to the news that the Golden-State Killer had been identified by a genealogist working the police agencies and using the gedmatch.com database. One of the questions (see below) showed that 85% of respondents were “reasonably comfortable” with the law-enforcement agencies using genealogy databases to identify criminals. The problem with this type of questioning is that it uses the most extreme example of criminal activity to bias the result. More importantly, travelling through Dublin to this show reminded me that it is less than 100 years since Ireland obtained her independence. This was in part due to the violent struggle in Ireland, including the Easter Rising. Many of the people involved in the fight for independence would have been classified as violent criminals by the British authorities. I doubt that most of those people, or indeed their relatives, would consider themselves criminals, or want their relatives identified via their DNA. This is not just an historical issue. In China, the DNA from millions of ethnic Uyghurs has been collected as part of a program to control dissent within that community. Further, it is estimated that up to one million Uyghurs are in being held in internment camps. As genealogists and many adoptees have found, DNA is a powerful tool in connecting families. This is not rocket-science. As law-enforcement agencies world-wide discover and use this technology, there will be calls for it to be made mandatory. I am not convinced that it is good for a society to gather such data. Any police database is open to abuse, as reported in the United States and United Kingdom. Without oversight the same thing will happen with DNA databases. The normal means to limit abuse (as I understand it) is through a judge examining the need. We now live in a world where our Privacy is continually being eroded. Social-media companies, such as Facebook, continue to over-reach in their attempts to gather information from us. Our location (and much more) can be identified via our mobile phones and car license–plate readers. Facial recognition technology is being deployed by both law-enforcement agencies and commercially. In most cases regulation and citizen consent is way behind usage. The same thing will happen with genetic genealogy databases unless the genealogy community take steps to stop it. how to solve the problem with DNA databases ? I am no expert on the issues, however it would be seem appropriate for FamilyTreeDNA to make a clear decision, are they working for genealogists or are they wanting to catch the “bad guys”. If it’s the former they should work to restrict all access by law-enforcement agencies, and their proxies, unless the requirement has been validated by due process. At an individual level I am withdrawing the DNA kits I manage at FamilyTreeDNA from their “Family Finder” cousin-matching process until it’s clear which direction the company is headed in. Finally, there is a reasonable suggestion from genealogist and legal expert Judy G. Russell that FamilyTreeDNA build-in an opt-in DNA database that law-enforcement agencies can us. The only problem with this is the fact that when an individual opt-in to this they also bring along all their relatives. That has always been an ethical issue with DNA. You have to feel a little sorry for Tanqueray, the gin brand owned by the drinks-giant Diageo. They have been producing the eponymous gin since Charles Tanqueray came up with a cunning plan in 1830. Their Tanqueray No.10 gin is for some people, including my wife, their favourite gin. These people should probably not be argued with. Even the basic Tanquerey London Dry Gin is a great gin. I have a bottle of it in my stock and am torn between drinking it straight away and waiting until I get time to review it. Tanqueray’s problem is that they aren’t really cool. Their gin is not an artisan gin produced in a 100 liter still called “Daisie” by two bearded hipsters, Ollie and Josh, in an old sheep-shearing shed in Middleton Tyas. I digress. What Tanqueray have done to broaden their appeal is produce a range of themed gins. The original themed gins werw the limey Rangpur Gin and the sweet and spicy Malacca Gin. This has now been followed by a Flor De Sevilla Gin which, funnily enough, brings a seville orange taste to the fore. A further extension of the range is the Tanqueray Lovage London Dry Gin, which I need to tell you about. If you, like me, get stuck with lovage, and cannot remember anything other than the Peter Schaffer play “Lettice and Lovage” (which he wrote a a vehicle for Dame Maggie) I can tell you that lovage is a perennial herb, best described as having a “tenacious” aroma similar to celery. In Germany the herb is often referred to as “Maggikraut” referencing the Maggi condiment, a product as quintessentially German as Lederhosen and “Fenster auf kip”. Day or Night Gin ? This is a hefty 47% ABV gin, please take your seats for the evening performance. What does it smell of ? Well, this one is firmly from the herb garden. Think of a mix of celery and angelica. What does it taste of ? Taken neat it’s only a few spoons of sugar way from the herbal drama of “Krauterlikors” such as Jagermeister, or the rather wonderfully names Aldi-Süd home brand of “Mummelmann”. It packs a mean lovage-themed punch, similar to the celery-seed themed Durham Gin I reviewed long, long ago. You should though, appreciate the quality of gin that Tanqueray produce. It’s a smooth tipple. Like the play though, this gin is designed to showcase the classic G&T. Bear in mind you do need a good tonic to partner this gin. You wouldn’t have the veritable Maggie acting opposite some Hollyoaks wannabe, and you should have this gin with some supermarket-brand tonic. Personally I’d go with something like the Fevertree Mediterranean Tonic, or even their Aromatic Tonic Water. Buy It ? I found it at my local international-travel retailer and, if you are passing through duty free, there’s a fair chance you’ll find it too. Neither of my go-to online retailers (the Galeria Kaufhof and the Lidl) had it in stock, but there were plenty of other online retailers who have it in stock. Prices are around the €40 mark, but you do get a litre of high-quality gin for your money. Overall ? 5 / 5 This is an excellent gin and your life is incomplete until you’ve tried it. It may not be replace you all-time favourite gin, but it will leave you smiling. About a year ago I wrote about the results of my BigY test, the discovery test of large parts of the male y chromosome. I thought it was worthwhile to post an update on my results and to explain why I think the BigY test is working. As a start it’s worth reviewing what has changed with the actual test and how you see your results.